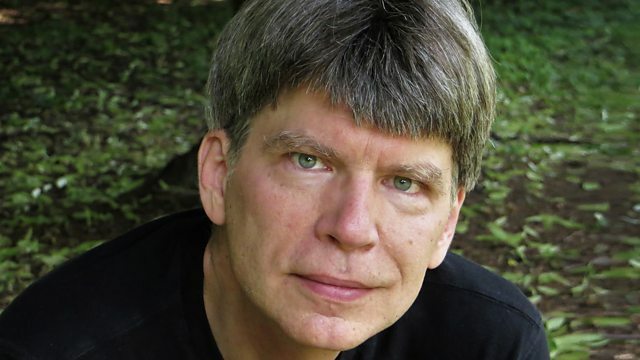 As part of Radio 3’s celebration of forests, Michael Berkeley’s guest is the American novelist Richard Powers. As part of Radio 3’s celebration of forests this autumn, Michael Berkeley’s guest is the American novelist Richard Powers. His latest novel, The Overstory, is his twelfth, and it’s a monumental work which was entirely inspired by trees. "A woman sits on the ground, leaning against a pine. Its bark presses hard against her back, as hard as life. Its needles scent the air and a force hums in the heart of the wood. Her ears tune down to the lowest frequencies. The tree is saying things, in words before words." Inspired by his passion for trees, Richard Powers has now moved to live in the forests of the Smoky Mountains which run along the border between North Carolina and Tennessee. "In 15 to 20 minutes, I can be up and walking in these forests that are recovering from a century-and-a-half of logging and see the way that nature persists and transforms and perseveres." On a brief trip to London, he looks back over a thirty-year writing career in which each novel is more audacious than the last. But one theme runs through all his writing: the power of music, and Powers plays the cello, guitar, clarinet and saxophone. His music choices include Dowland’s “Time Stands Still”, Bartok’s String Quartet No. 4, Bach’s Cantata BWV 100, and Charles Ives’ Concord Sonata. Performer: Ronn McFarlane. Singer: Julianne Baird. Orchestra: Hallé. Conductor: John Barbirolli. Singer: Janet Baker.